DeLancey, the FDA spokeswoman, said "We have not been doing any testing. We've been working with NOAA to keep an eye on U.S. waters, to see if there is any cause for alarm, and we do have the capability to begin testing if that does occur." Asked to explain what kind of monitoring was taking place in the ocean, DeLancey said, "You would have to talk directly to NOAA ... I don't really want to speak for another agency." DeLancey said that so far, there's no reason for concern about Fukushima. The radioactive materials in the water near Fukushima quickly become diluted in the massive volume of the Pacific, she said. Additionally, radioactive fallout that lands on the surface tends to stay there, giving the most unstable ones isotopes like iodine time to decay before reaching fish, she said. Of course, radioactive isotopes like cesium 137 are very long-lived, and so won't necessarily decay before they reach fish. U.S. public-health officials sought Tuesday to reassure consumers about the safety of food in the U.S., including seafood, amid news that fish contaminated with unusually high levels of radioactive materials had been caught in waters 50 miles from the stricken Fukushima nuclear plant in Japan. Thomas Frieden, head of the CDC in Atlanta, said he expected continued detection of low levels of radioactive elements in the water, air and food in the U.S. in coming days, but that readings at those levels "do not indicate any level of public health concern." Is this yet another example of the government responding to the nuclear accident by trying to raise acceptable radiation levels and pretending that radiation is good for us? 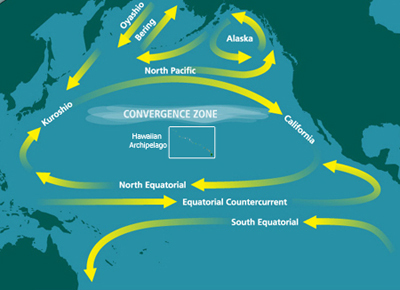 Indeed, the ocean currents head from Japan to the West Coast of the U.S.
Too bad you guys are too lame and corrupt to tackle satanism. The government should get less tax money so that the money could be directed toward capable people with NO VESTED INTEREST in nuclear, medical, political or agriculture industries, that could provide the citizens with accurate information. They should be exempt from censorship. The equipment necessary to record and provide this vital information plus travel & gas monies would come with the job. All schools should get at least one student able to carry on with this vital task when he graduates. We all have to become proficient in reading nuclear measurements since we have to concern ourselves with many nuclear power plants; their cooling pools and the processing of nuclear materials. Governments lie, cheat, and obfuscate the facts. They will not help us. They won't help us. They will distract us. I consider this nuclear so-called accident a soft kill situation where in the agenda for reduction of populations has begun.